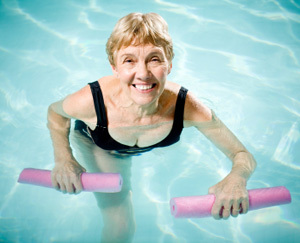 An active mind and body are essential quality-of-life elements for everyone, and this connection holds true for seniors in care facilities. Institutional life can lead to a downward spiral of diminished independence, lack of physical activity, declining physical and mental function, and reduced quality of life. A study found that exercise programs developed specifically for institutionalized seniors and adaptable for those with thinking (cognitive) and physical disabilities were helpful in maintaining health-related quality of life. An adapted tai chi exercise program, 30 minute sessions four times per week, involving exercises that emphasized body awareness, weight shifting, alignment, and coordination. A cognition-action program, 30- to 45-minute sessions twice per week, involving guided stretching, resistance, balance, and weight-shifting exercises presented so they were clearly applicable to daily life. A control group that received usual care for six months. A little exercise, a big difference? After six months, people in the exercise groups scored the same as before on tests measuring their ability to perform activities of daily living (ADL), while the scores had decreased (become worse) in people in the usual-care group. After 12 months, there were smaller declines in ADL scores in the exercise groups than the usual-care group, though the differences were not statistically significant. Some specific ADL differences were noted at 12 months: walking abilities were better preserved in the cognition-action group, continence was better preserved in the tai chi group, and eating was better preserved in both groups compared with the usual-care group. Scores on physical function tests were unchanged at six months and decreased less at 12 months in the exercising groups compared to the usual-care group. These differences were more pronounced in the cognition-action group. Overall neuropsychiatric test scores, measuring symptoms such as agitation, depression, anxiety, and apathy, declined in the usual-care group but improved slightly in the exercise groups at both the 6-month and 12-month assessments. These differences were also slightly more pronounced in the cognition-action group. Based on this study, it seems that even a little bit of low-intensity exercise each week can benefit seniors, especially when the exercise is adapted to their capabilities and teaches useful skills that aid in life’s daily activities.